About this time last year, AMD's new Bulldozer-based FX series launched to bright-eyed system builders who expected the new architecture to challenge Intel's increasingly comfortable position in the upper-end processor market. Unfortunately, Bulldozer wasn't all it was cracked up to be. Its performance fell short of the then 9-month-old Sandy Bridge processors and in some cases, even failed to surpass the Phenom II range. Following Bulldozer's mediocre reception, AMD insisted that the new architecture was still young and would serve as a "solid building block" for the FX series. Although hotfixes such as one that addressed an SMT inefficiency have boosted Bulldozer's performance slightly, little has changed with AMD's FX series in the last year—until now, anyway, with today marking the arrival of the company's second-generation FX offerings. AMD is refreshing its desktop processors with Piledriver, an enhanced version of Bulldozer that focuses on improving instructions per clock and frequency—something we witnessed earlier this month when we tested the company's new Piledriver-powered Trinity APUs. In other words, instead of a major overhaul, Piledriver picks up where Bulldozer left off, which may disappoint those who wanted AMD to abandon the architecture. Perhaps the most controversial topic of last year's FX series was its new integer core/module design. Bulldozer's floating-point unit featured a complete redesign with improvements to support many new instructions while also allowing resource sharing between cores. There were two 128-bit FMACs shared per module, allowing for two 128-bit instructions per core or one 256-bit instruction per dual-core module. Although each module appears as two cores in the operating system, they don't have as many resources as traditional AMD cores. 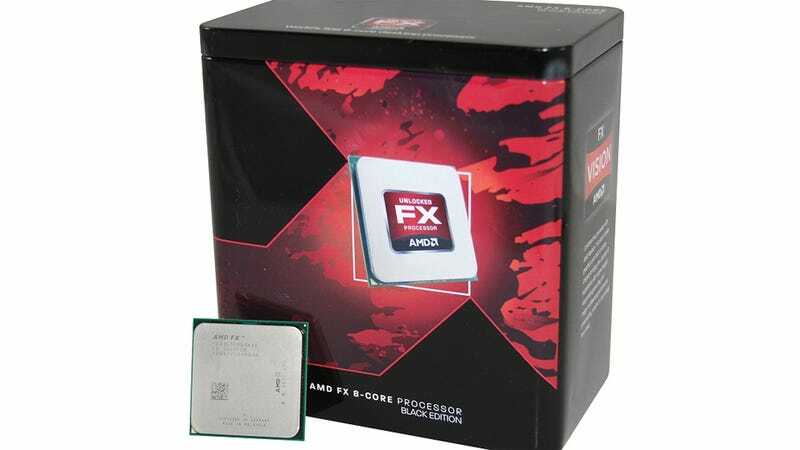 So, while AMD claimed that its FX-8150 was the first true eight-core desktop processor, it wasn't in reality and its performance reflected that. Again, Piledriver doesn't change this architecture in any significant way, meaning the module design still exists in today's Vishera FX series processors. As we saw recently when testing the A10-5800K Trinity APU, Piledriver offered a healthy improvement in power consumption, which allowed AMD to increase the chip's clock frequency by 31% over the older A8-3850. For a sample of what this means for the new FX series processors, AMD has said that the chips will offer as much as 20% to 30% more performance in digital media workloads—a significant boost, if accurate. The parts released today include the FX-8350, FX-8320, FX-6300 and FX-4320, which are detailed above. Although AMD is releasing four new FX chips, we're only testing the FX-8350 and FX-6300. Compared to their predecessors, the FX-8350 comes clocked a little over 10% higher than the FX-8150, though its max turbo core frequency is the same at 4.2GHz, while the six-core FX-6300 is clocked 6% higher than the FX-6100. Interestingly, as an aside, the FX-4300 is clocked at the same 3.8GHz speed as the older FX-4150, but while the older model featured a full 8MB L3 cache, the FX-4300's cache has been cut in half to 4MB. Also of note, all of the new Vishera FX models are supported by the existing Socket AM3+ and 9xx series chipsets, they have Turbo Core 3.0 technology and they employ the same dual-channel DDR3 memory interface. AMD has supplied us with its top-end FX-8350 processor for testing. Thankfully, the FX range is unlocked and the Asrock Fatal1ty 990FX motherboard allowed us to enable just six cores, making it possible to emulate the FX-6300. This board also allows customization of the Turbo Core and Max Core multiplier for accurate results. Unfortunately, because the FX-4300 processor features a smaller 4MB L3 cache we're unable to emulate that processor. AIDA64 demonstrates that AMD hasn't changed anything to improve the memory subsystem of the Piledriver FX processors. Although the FX-8350 had 4% more read bandwidth at its disposal, keep in mind that it is clocked 11% higher than the FX-8150. Compared to the Core i5-3470, the FX-8350 was 24% slower when measuring read bandwidth and 44% slower in write bandwidth. We found AIDA64's reported L2 cache performance to be odd, as the new Piledriver FX CPUs had a similar write performance to Bulldozer while their read results were halved. Either something has gone drastically wrong with the Piledriver processors or, as is the more likely explanation, AIDA64 needs to be updated. In either case, we'll be looking into this over the next few days.